Seventy percent of the delegates using Twitter said it helped them to increase the value of their ICCA Congress experience, and almost 75 percent claimed that Twitter helped them to increase their interaction with other members. Exactly 7,180 Tweets with hashtag #ICCAWorld were sent in the three weeks before, during and the 1.5 weeks after the Congress Oct. 13-Nov. 14). The #ICCAWorld hashtag reached almost 2.5 million unique users and had almost 15 million impacts*. There were 887 delegates at the Congress. On Nov. 6, one day after the Congress, there were 963 unique #ICCAWorld contributors. In the 1.5 weeks after the Congress, this number quickly climbed toward 1,500. Additionally, 1,329 of the 1,611 Tweets in the week and a half after the Congress were retweets. ICCA specifically asked delegates to share the hottest content and key takeaways of education sessions with the ICCA community, using hashtag #ICCAWorld. The large amount of #ICCAWorld retweets (62 percent) indicates that the content shared with this hashtag is perceived as being valuable. ICCA used its community hashtag #ICCAWorld as the event hashtag, to encourage their members to take the value of the offline ICCA member network to social media and use it throughout the year. “Besides, everybody knows it is 2014, right?” Vleeming added. The critical window of opportunity on social media for events is not only during the event itself, but also in the two-three weeks in the run-up to the event. 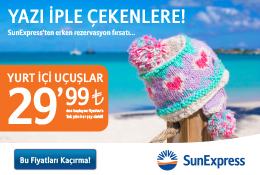 In order for social media followers and friends to see that they are going to the ICCA Congress and what they are missing out on, ICCA asked delegates to share images, tips and advice on their journey to- and preparations for the #ICCAWorld Congress in Antalya. There were 753 tweets, which include #RoadtoAntalya. 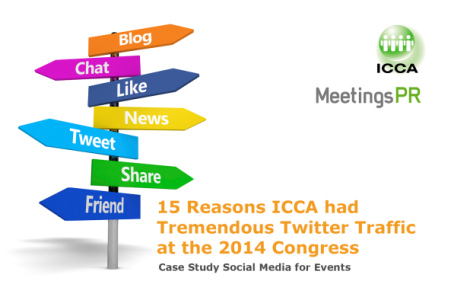 Vleeming wrote a blog post “15 Reasons ICCA had tremendous Twitter traffic at the 2014 Congress” on MeetingsPR.com to share ICCA’s case study with other meeting planners, in which he asks if ICCA did just get lucky as the meetings industry is increasingly using social media, or that ICCA hit the right spot with its social media strategy. ICCA Congress speaker and social media expert Michael Heipel wrote a blog post on it after returning from the Congress.